Date: 7th & 8th April 2017. Date: 6th & 7th January 2017. Date: 21st & 22nd October 2016. Date:6th & 7th October 2016. 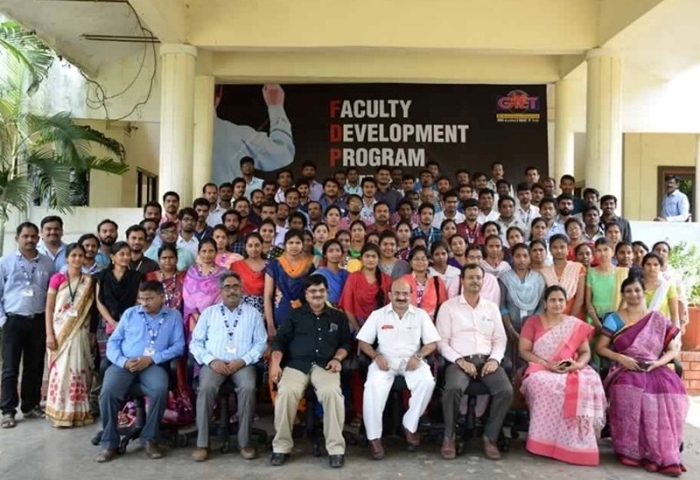 A One-week Faculty Development Programme (FDP) on Teaching Learning Processes was organized during 07-11 May 2018 for the teaching staff. 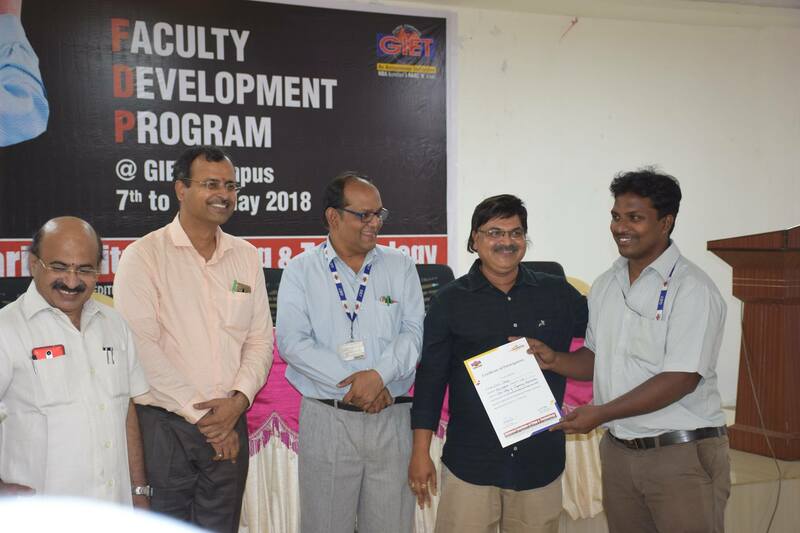 Dr. M. Srinivasa Kumar, Principal, Narasaraopet Engineering College, Narasaraopet was the Chief Guest of the inaugural ceremony held on 07 May 2018, which was attended by Dr. D. V. Ramamurthy, Principal, GIET (A), Dr. S. S. N. Raju, Principal, GEC, Dr. M. Varaprasada Rao, Dean of Academics, GIET (A) and Dr. T. V. Prasad, Director, School of Computer Sciences, GIET(A). There were over 157 faculty members registered for the event. The first two days of the FDP were common for all branches and focussed solely on teaching-learning processes. The next two days (i.e. 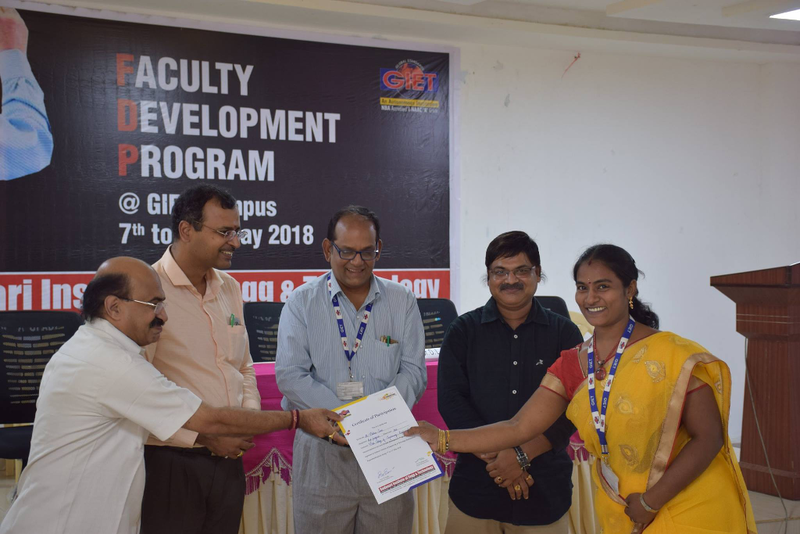 09 May and 10 May) were allocated to branch/group wise talks/lectures, which were completely addressed by 11 subject experts from leading institutions like NIT Warangal, NIT Goa, Xavier Institute of Management Bhubaneswar, etc. in 24 sessions. The topics deliberated were from a range of areas covering foundations of education system, National Policy on Education (NPE), CO-PO mapping, attainment, R&D, Outcome-Based Education (OBE), enhancing employability skills, course planning and delivery, quality assurance, adolescence behaviour, effective assessment, teaching and learning styles, motivation, etc. The external experts provided more of hands-on experience on various aspects of teaching-learning processes such as preparation of lesson plan, course delivery, assessment and evaluation (rubric design), etc. for a course that they would be teaching in the forthcoming semester. Based on the feedback, the participants expressed that they had an excellent learning experience during the FDP and were immensely benefitted from the deliberations. They specifically highlighted that topics such as adolescence behaviour and motivation, rubric design, identifying research areas, initiating writing research papers, filing for seeking funding from funding agencies, etc. were of immense help to them as they were not able to get help to the needed level and now their doubts have been cleared. The arrangements like lunch, refreshments, transport, accommodation, etc. made were up to their satisfaction level, and overall they had a pleasant time in learning. The valedictory ceremony on 11 May 2018 afternoon was attended by Dr. D. V. Ramamurthy, Principal, GIET (A), Dr. S. S. N. Raju, Principal, GEC, Dr. M. Varaprasada Rao, Dean of Academics, GIET (A) and Dr. T. V. Prasad, Director, School of Computer Sciences, GIET(A). Certificates of participation were awarded to the participants. 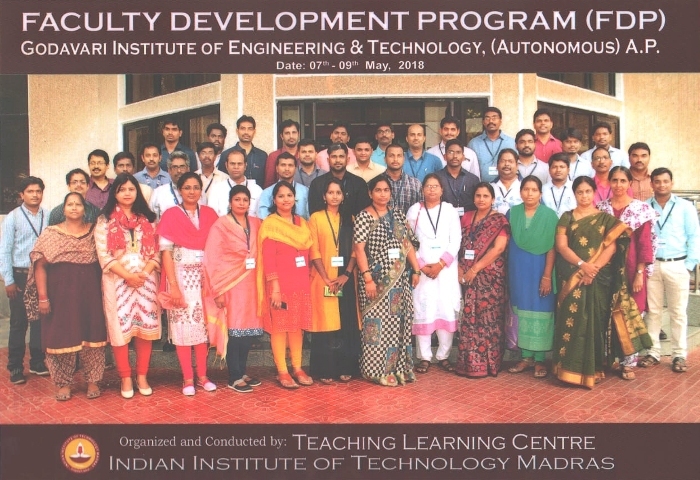 GIET Faculty team participated in “Faculty Development Programmes” (FDP) organized by Teaching and Learning Center, IIT Madras for IIT Faculty as well as teachers of outside science and engineering colleges, with the help of experts from Texas A&M and Wipro Technologies. 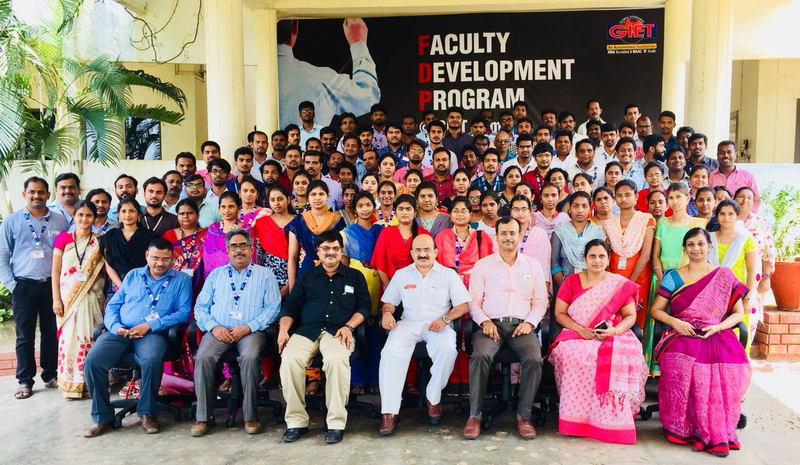 FDP focuses on current and emerging teaching-learning methodologies/ technologies to motivate the faculty towards professional excellence and satisfaction. A typical FDP will be of three days in duration. What do you expect from an FDP? The faculty development programs raise the following questions and assist you to find answers which are supported by research-based data. How to motivate the learners? How do you familiarize the diverse group of learners that you are teaching in a classroom? How do you write learning outcomes for your course? How do you conduct classes based on active and cooperative learning strategies? How do you make an assessment plan? How do you do the reflective teaching? 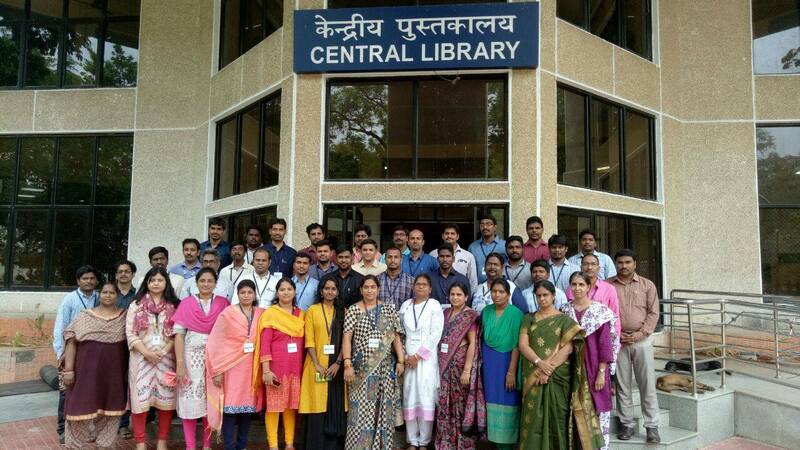 TLC conducts sessions on ‘experience sharing’ in teaching by faculties in science and engineering disciplines at IIT Madras. The purpose of these sessions is to bring both senior and junior faculties to one platform so that the rich individual teaching/learning experiences at IIT Madras can be shared to all, for mutual benefits. The discussions are oriented towards bringing out the real issues/ethos of the campus and how well we respond to them. SANKRANTHI sambaralu celebrated on 12-01-2019 Saturday in our campus premises. Mechanical Engineering Design Challenge Contest.